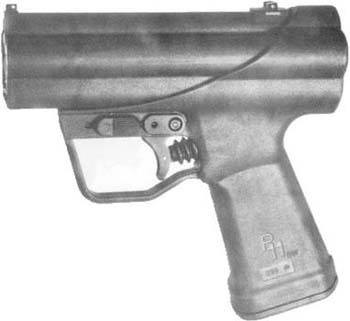 Effective Range: 15 meters under water - 50 meters above water SOF operatives use this virtually silent pistol for infiltration from sea to shore. 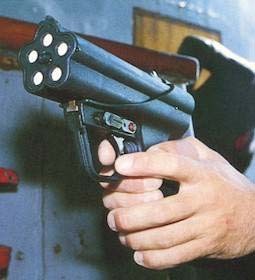 An electric charge is used to fire the rounds. The "Darts" of the P-11 are fin / drag stabilized and are about 100mm or almost 4 inches in length. 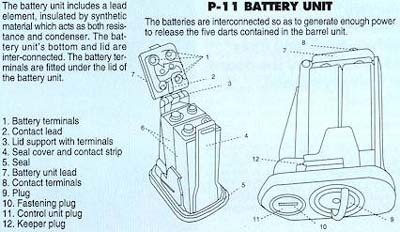 The P-11 darts have material similar to solid rocket fuel in them and are ignited by the battery pack. This gun was classified for several years. Range is limited but the P-11 is deadly out to almost 50 feet. The whole gun is sent back to the factory to "reload".